Cenchrus barbatus Schumach., Cenchrus catharticus Delile, Cenchrus catharticus Schltdl., Elymus caput-medusae Forssk. The Indian sandbur (Cenchrus biflorus Roxb.) is a valuable fodder plant providing edible and nutritious grains. The Indian sandbur (Cenchrus biflorus Roxb.) is a tufted annual grass with ascending culms, up to 0.9-1 m high (Skerman et al., 1990; Clayton et al., 2006). The plant roots and branches from the constricted nodes. The stems are cylindrical, smooth and glabrous. The leaves are alternate with linear blades, 2-35 cm long x 5-8 mm broad. The leaf surfaces are rough, puberulous or pilose (Clayton et al., 2006). The inflorescence is a spike-like panicle, 3-15 cm long x 9-12 mm in diameter. The rachis bears 1-3 lanceolate spikelets enclosed by a diamond-shaped involucre of prickly bristles (Skerman et al., 1990; Clayton et al., 2006). The involucres, or burs (burrs), are deciduous when the seed becomes mature. The burs strongly adhere to fur or skin for dissemination, and can hurt animals and humans (see Potential constraints on the "Nutritional aspects" tab) (Burkill, 1985). 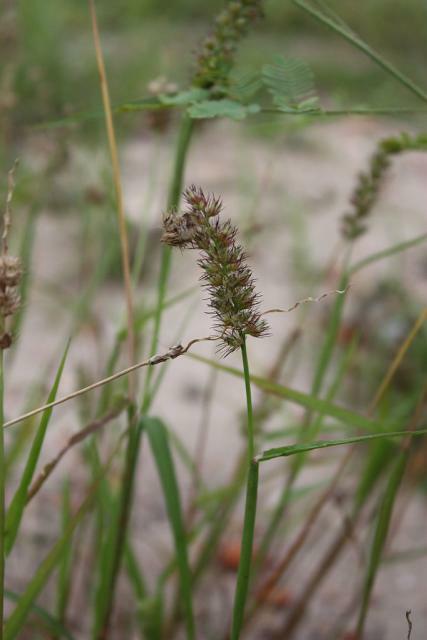 While it is difficult to thresh, Cenchrus biflorus is a multi-purpose cereal that provides edible and highly nutritious grains (Brink, 2006; Burkill, 1985). It is considered a famine food in several areas (Sahel, India) (Burkill, 1985). In the Sahel, its grain is regularly collected by the Tuareg people (Brink, 2006). The grain can be eaten raw or prepared into couscous or porridge. It can be used to make refreshing drinks, unleavened breads (kisra) in Sudan and cakes in Mauritania (Brink, 2006; Burkill, 1985). The leaves are eaten in times of scarcity in the Thar desert in India. During favourable years in India, the grain is mixed with sugar and ghee (clarified butter) to prepare a childrens’ delicacy (Brink, 2006). The Indian sandbur is a valuable fodder plant, particularly at early stages of development or after the grains and the spiny involucres have fallen off. It can be cut several times during the rainy season and made into hay or silage. A drought-resistant forage, it is of utmost importance during the dry season (Brink, 2006). In the Sahel, Cenchrus biflorus sometimes constitute the only available fodder throughout the dry season (Maliki, 1981). Despite these desirable characteristics, it is often considered a noxious weed (Brink, 2006). Cenchrus biflorus is widespread throughout tropical Africa, from Mauritania to South Nigeria and in North-East, East and South Central Africa. It is abundant in the African Sahel as "ephemeral prairie" (Skerman et al., 1990). It grows in Arabia, Iran, Pakistan and India (Brink, 2006; Quattrocchi, 2006; Burkill, 1985). It was introduced in North America and Australia (Brink, 2006). It is found in dry areas, sandy dunes or bare sandy ground, desert fringes, disturbed land, areas of abandoned cultivation, fallow crops (Quattrocchi, 2006; Brink, 2006). Cenchrus biflorus is a summer grass that grows from sea level up to an altitude of 1300 m, in hot tropical areas where annual rainfall ranges between 250 and 650 mm. It is extremely drought-tolerant but has no tolerance of flooding. It is mostly found in frost-free areas (Skerman et al., 1990). Cenchrus biflorus propagates from seedlings that can be spread over a wide area because of the seed burs that adhere to the coats of animals. It germinates rapidly, and outcompetes other grasses or legumes in mixed swards, particularly under high levels of soil nitrogen (Gillard et al., 1982). In the Sahel, it is often grown with the gum arabic tree (Senegalia senegal). In Senegal and Chad, it has yielded up to 590-600 kg/ha of above-ground biomass (Skerman et al., 1990). Cenchrus biflorus is better consumed by animals before flowering, when its stems are soft. It provides rich and valuable wet season grazing from June to August (Skerman et al., 1990). It is resilient to grazing due to its fast growth and ability to tiller in response to defoliation and trampling (Jamnadass et al., 2006). Once the seed burs have shed, Cenchrus biflorus provides an excellent standing hay. It is one of the best available standover feeds in the Sahel (Skerman et al., 1990). It can be cut young for good quality hay. Mature Cenchrus biflorus grass can be profitably made into silage and this will soften the prickly bristles of the burs (Burkill, 1985). For instance, silage was made from wilted chopped grass stored in plastic bags for 4 weeks, with diluted molasses used as a carbohydrate additive (2% w/w) (Fatur et al., 2007). In arable fields, Cenchrus biflorus is regarded as a noxious weed because of its adherent burs that facilitate its rapid spread (Makhabu et al., 2012). The Indian sandbur is a pioneer species able to thrive in windy sandy areas. In the Sahel, it is regarded as a desertification indicator. It has been used for the reclamation of degraded land in the Thar desert of Rajasthan (Skerman et al., 1990; Boudet, 1977). Cenchrus biflorus has an extremely variable composition, and crude protein contents ranging from 3% to more than 20% (the latter in young grass) have been reported. However, its quality is generally low. The prickly bristles of the burs strongly adhere to fur and skin. They may alter wool and skin quality, and hurt the mouth and stomach when animals eat the plant after flowering. In a 1980 survey, Wodaabe pastoralists in Niger described mature and thorny Cenchrus biflorus grass as a cause of poor health in cattle (diarrhoea, palpitations, cough, etc.) that did not promote lactation (Maliki, 1981). Cenchrus biflorus forage is readily eaten by all classes of livestock (Skerman et al., 1990). It is preferred by sheep in the Thar desert in India (Khan et al., 2003). Cattle like grazing it soon after it sprouts, when the grass is young with short and soft stems (Maliki, 1981). Information about the nutritive value of Cenchrus biflorus is scarce. It is likely that the young grass has a very good nutritive value that decreases sharply after flowering. Early trials in Tanzania reported rather high OM digestibility values (70-72%) for fresh grass containing 10-12% protein (DM) (French, 1941). A more recent trial in Sudan of poor quality grass (crude protein 3% DM) reported an acceptable in sacco OM degradability value of 67% after 120 h, but the degradation rate was low after 48h at only 3%/h (compared to 6%/h for cocksfoot hay) (Ahmed et al., 2003). An early trial in India on good quality hay (crude protein 9% DM), cut at the early inflorescence stage, reported an OM digestibility of 47-49% (Lander et al., 1932), while a recent trial in Sudan reported a value of 59% for a hay with 7% protein (Fatur et al., 2007). Brink, M., 2006. Cenchrus biflorus Roxb.. Record from PROTA4U. Brink, M. & Belay, G. (Editors). PROTA (Plant Resources of Tropical Africa / Ressources végétales de l’Afrique tropicale), Wageningen, Netherlands.